The centenary edition of the Tour de France visited Corsica for the very first time in 2013. The island has been a regular location for the Criterium but never the Tour. The Grand Départ took place on the 29 June 2013 from Porto-Vecchio. Having never visited Corsica the Tour stayed for four days - the Presentation of the Teams and three days of racing. 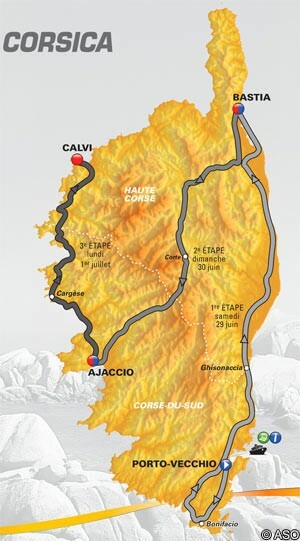 The three stages took place in both Departments - Corse Du Sud and Haute Corse - and provided in total 500km of racing. The Crit came to Corsica in 2010. The 82nd edition was run here in March 2014 and was won by Jean-Christophe Péraud of team AG2R. Previous winners in Corsica have included Cadel Evans and Chris Froome. There had been some speculation that the 2015 race may move to Yorkshire but it was announced on 18 September that the next two editions will continue to be in Corsica. This is a new one day race that will take place from 2015. The hope is to establish it as a 'one day classic' and build on the experience of the Criterium and TDF. 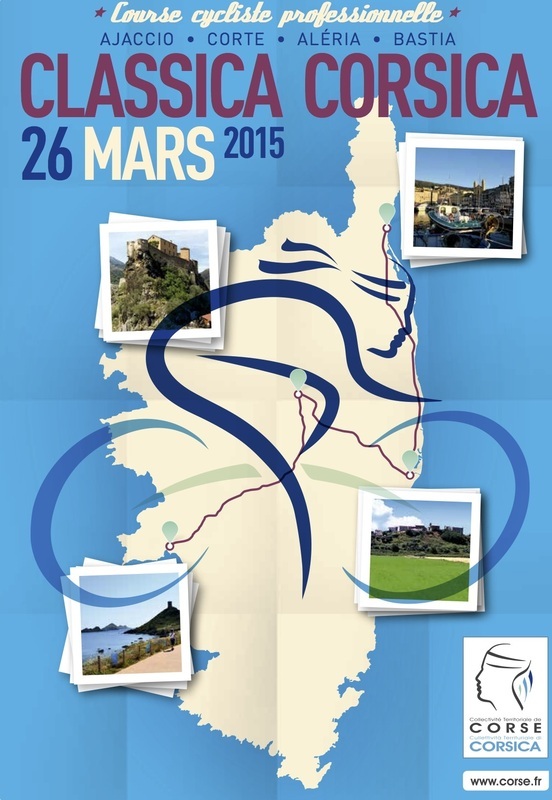 The inaugural edition of the race will take place on thursday 26 March 2015 departing Ajaccio and finishing in Bastia. It's a 204km route and takes in two categorised climbs, which is the reverse of the 2013 TDF stage until Corte, and then off to the east coast for a relatively flat run into the finish and what seem likely will be a bunch sprint. If you type into Google, ‘Tour de Corse Cycliste’ you’ll find 112,000 results largely about a bike race which first ran in 1920. That first race was won by the very aptly named Napoleon Paoli - yes the very same man who later that season crashed into a donkey during the Tour de France. I say aptly named because of course Napoleon was born in Ajaccio and Pasquale Paoli was a revered Corsican patriot and author of the state constitution. The last seen of Napoleon Paoli he was disappearing into the distance astride said donkey and later abandoned the tour after being hit on the head by a rock – all true! Since 1920 the Tour de Corse Cycliste has been run 36 times. The 37th rolled out of Bastia on the 23 May for four days of racing over 516km. Notable past winners have included Bernard Hinault in 1982 and, in the preceding year, Stephen Roche. It was Roche’s first pro victory and he beat Hinault in the process. No surprise then that the ‘Badger’ should come back a year later and right the wrong, as well of course as winning the Tour de France in ‘81 and ‘82. Stephen followed his win in Corsica with victory in the Paris-Nice and the rest as they say, is history.